How much do your kids really know about recycling? 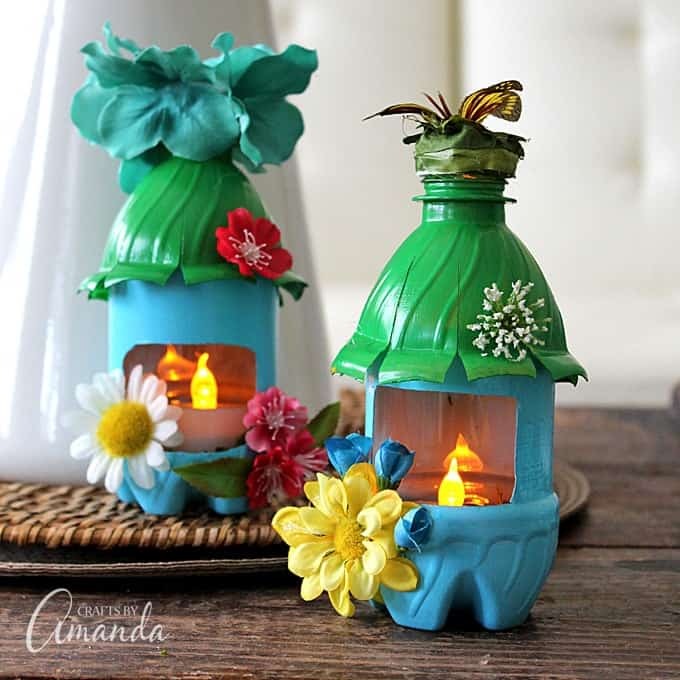 Before I show you how to make these cute fairy house night lights, let’s talk about teaching kids to recycle. I know when I was growing up it wasn’t a big part of our daily lives like it is today. Kids learn about recycling at home and in school, but it’s up to us to keep the momentum going. I like to teach it through recycle crafts. There are plenty of ways to encourage recycling, like turning what would otherwise be garbage into fun craft projects, which if you’ve been following this blog for a while you know I am passionate about! 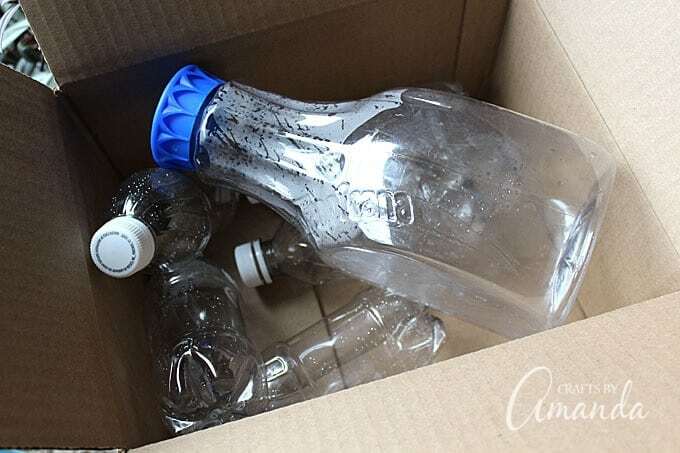 There are lots of ways to turn recycling into a game with sorting and color coded boxes or you can save this huge collection of plastic bottle crafts to do throughout the year. 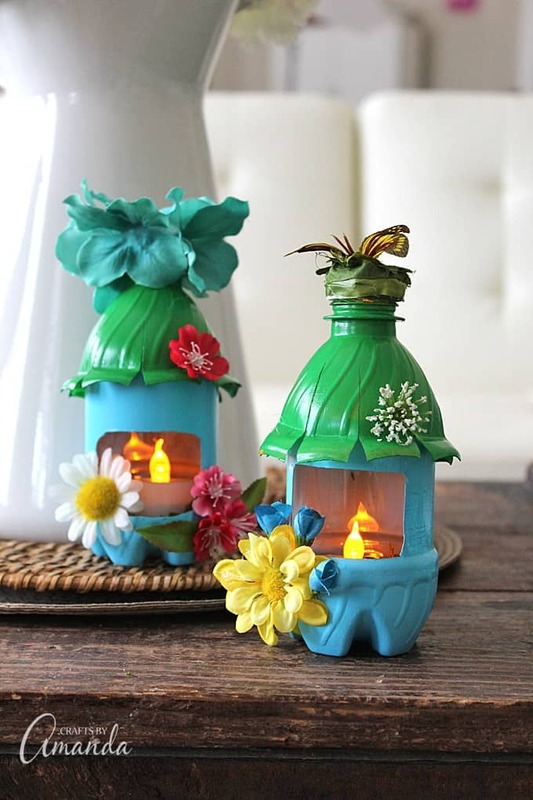 These cute fairy house night lights used to be empty plastic water bottles. You can find them along the roadside sometimes, but hopefully they are usually in the recycle bin. My neighbor’s grandchildren helped me out today by picking up some discarded plastic bottles along the tree line right by their elementary school. Sounds like their school is the perfect candidate for a Recycle Rally! 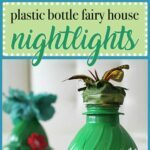 We collected several plastic bottles and washed a couple out with warm soapy water so we could turn them into these fun and colorful fairy house night lights! I was really proud of the kids as they truly wanted to keep their environment clean. It was pretty chilly out today, but they insisted on picking up the trash and disposing of it properly, including recycling it. We talked about how to look at the recycling symbols on the bottom of the bottles so they would know what could be recycled and what couldn’t. Once we were back inside they sorted their findings and we washed several bottles for our craft project. Does your school teach kids to recycle? I’m sure they do, but it wouldn’t hurt to suggest a Recycle Rally for them as well! It’s a great way to educate kids and help keep our earth beautiful for these future generations. 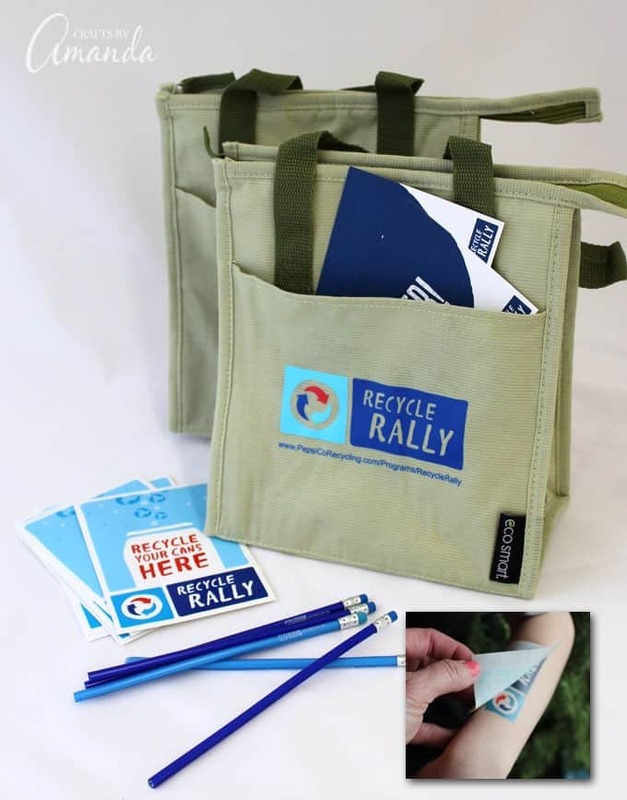 I encourage you to look into getting a Recycle Rally started at your child’s school. It’s a free nationwide program that provides valuable incentives and resources to help make recycling easy, fun and rewarding! 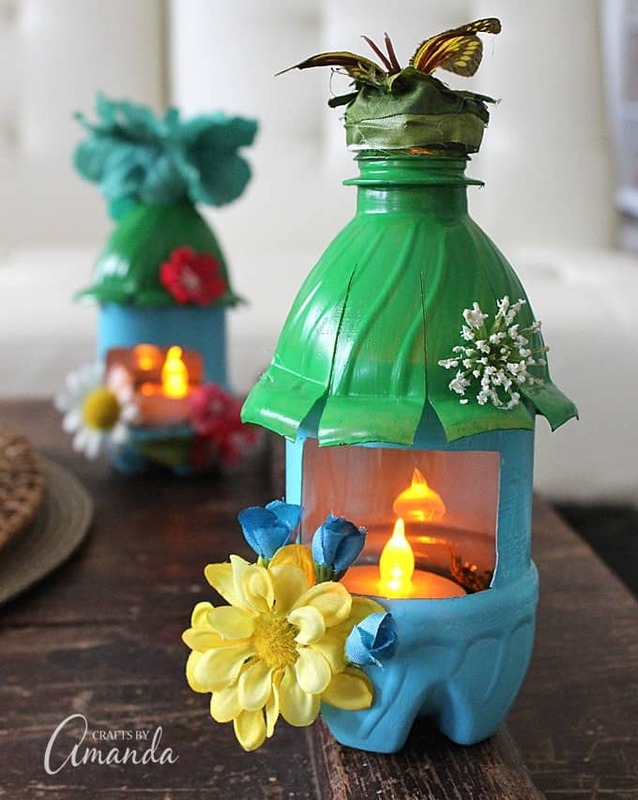 Now I’d like to show you how to make these sweet fairy house night lights that you can use anywhere in your home, including a child’s room or a nursery. There are affiliate links in this post. That means if you buy something from that link, I will earn a small commission, but it won’t cost you anything additional. 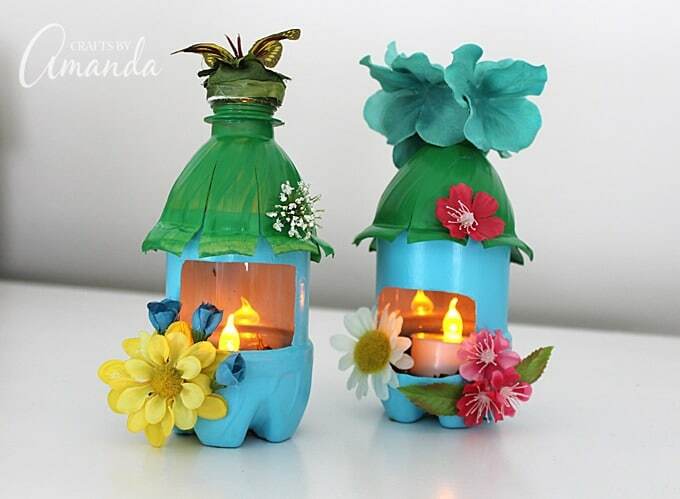 These fairy house night lights were really fun to make and so easy! 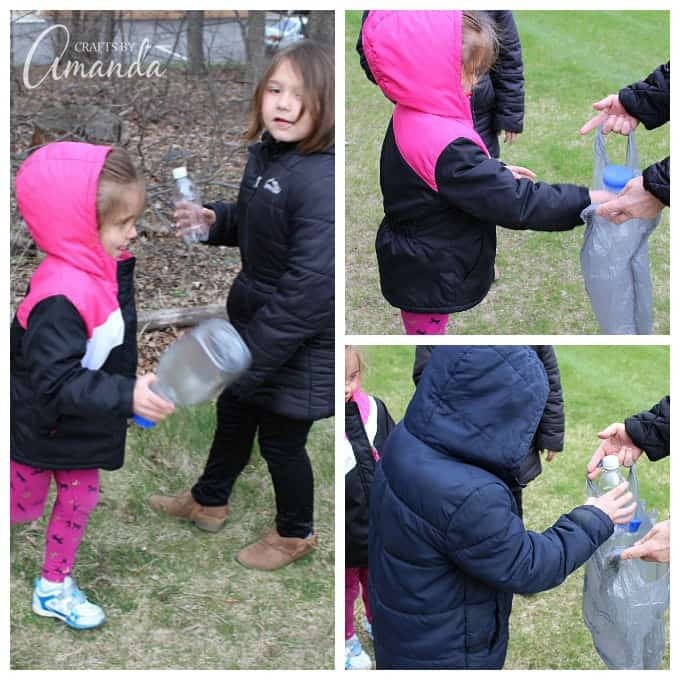 A great way to turn some empty water bottles into something cute and useful. 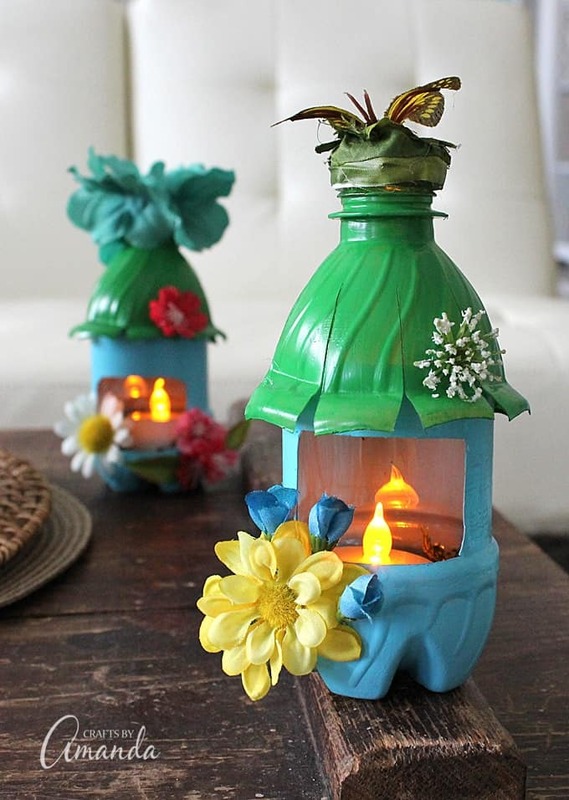 These would even be sweet out on the patio for those warm summer nights! You can get a printable version of this craft below or watch the video above to see how it’s done. 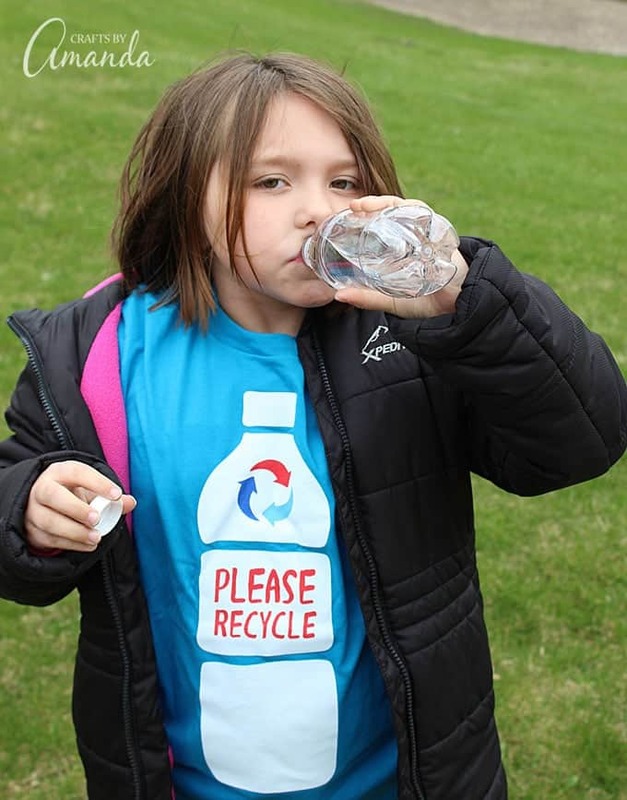 Don’t forget to check out Recycle Rally and talk about getting your child’s school signed up for this free and encouraging program about recycling! 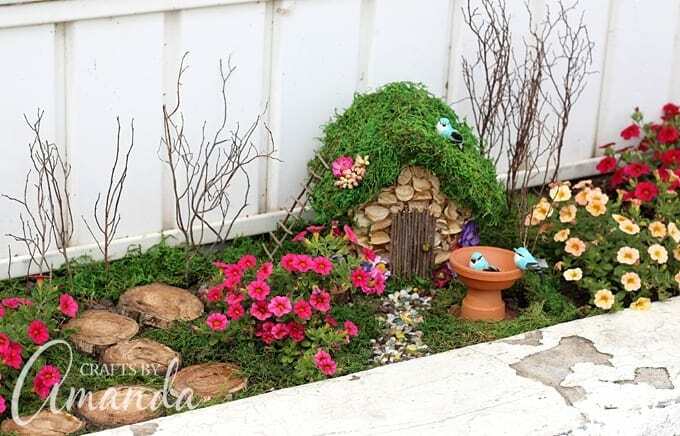 I will show you How to Start a Fairy Garden in this post. From decorating a simple wooden birdhouse to creating the landscape around it. This fairy garden spend the entire summer of 2015 outside of my studio. 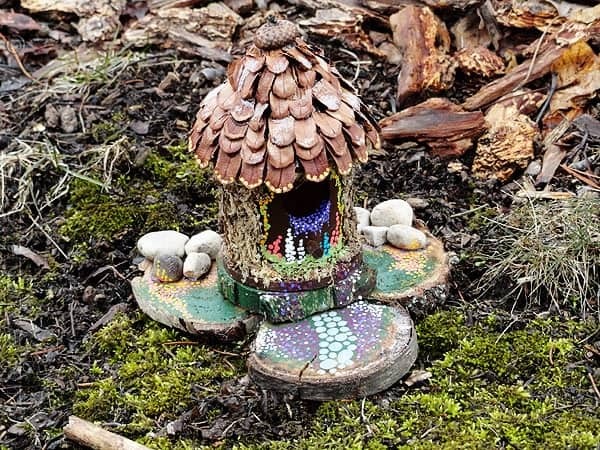 This Birdhouse Fairy House is the first fairy house I ever made. The birdhouse cost $1.00 and I used natural elements as some paint to decorate it. Find out more by clicking the photo. 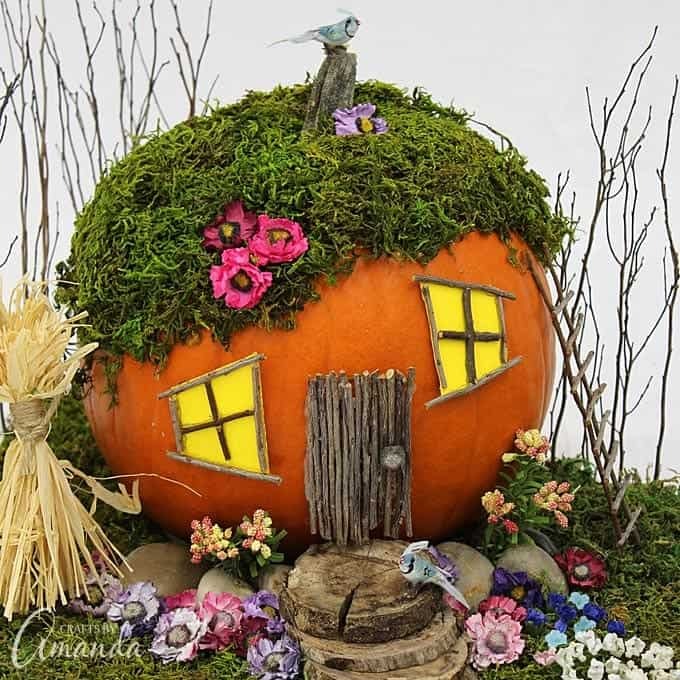 My daughter and I created this Pumpkin Fairy House as an entry into the pumpkin decorating contest where she works. She actually won first prize! It’s a fun project, but if I did it again I would use a fake pumpkin. Watch the video below for the complete instructions, you can also print the instructions at the end of this post. Cut top portion of bottle off with craft knife. Remove the lid and set aside. Cut off the plastic band around the neck of the bottle. Paint both halves of the bottle with colors of your choice. Allow to dry 30 minutes then repeat for a second coat. Cut a window in the bottle half of the bottle, large enough to fit the tea light inside. Cut slits halfway up the top half of the bottle, about 1-inch apart. Bend the ends of each slit upward so that they stick out. Decorate the outside of the house with silk flowers. Cover the bottle lid with silk leaves or flowers. Place lid back on the neck of the bottle. Add some hot glue to the inside of the bottom half of the bottle and line the bottom with moss. Add tea light candle. Place "roof" on top of the "house". Amanda Formaro is the crafty, entrepreneurial mother of four children. She loves to bake, cook, make kid's crafts and create decorative items for her home. She is a crafting expert and guru in the kitchen and has appeared online and in print publications many times over the years. She is also the editor for the Home & Garden channel at Craft Gossip and owner of FunFamilyCrafts.com. I love it so much! Thank you! Thanks Christy! So glad you like it so much, hope you have fun creating! I see that you used LED candle. What if I use the real burning candle? Is it safe for the bottle to not get burned? No I would not use a real candle as it will melt the plastic. What a great channel Janie, thanks for sharing! Do you know if this would be safe as bird houses? Or possible Squirrel feeders? I’d like to make that a summer project for my Grandkids but I don’t want any animals to get sick. I’d have to use a paint sealer on the outside but worry that the animals especially squirrels nawing on the plastic or glue. Wonderful idea. Make me want to make a whole fairy village! Fun idea hanging them from the awning! Great idea! Tried to sign up for your newsletter but the icon kept closing. This is also a great project for a grandparent to do with their grandchild. I love teaching my grandkids different ways to recycle. Wow this is absolutely fantastic! I cannot wait to get my daughter and make a couple of these!! Now I noticed that you used small little bottles…. I have 20 oz bottles that I can recycle. Will this work for that size or do we need those small little ones? Amanda is a well-known craft expert and craft book author. She loves to create on a daily basis. Find out more here..
All images and text copyright Amanda Formaro 2014. For the purposes of featuring a post from Crafts by Amanda, you may use one photo that must be credited and linked back to the appropriate post on this blog. Please do NOT copy and paste anything from this website as it constitutes a violation of the AF/AC copyright. Amanda Formaro is a participant in the Amazon Services LLC Associates Program, an affiliate advertising program designed to provide a means for sites to earn advertising fees by advertising and linking to Amazon.com. All new subscribers will receive my craft book "5 Christmas Ornaments to Make" absolutely free! Enter your name and email address below for instant access. And each week we'll send you free crafts and recipes!